Kulkea Tandem Ski Boot Bag. I’ve said it before, and I’ll say it again: a good ski boot bag can make a ski mom’s day. Frankly, a good ski boot bag can make anyone’s day. When it comes to efficiently organizing, neatly storing and easily transporting ski gear and clothing, I’m all in on ski boot bags. Today, I’m excited to share the new Tandem Ski Boot Bag from Kulkea. The Kulkea Tandem ski boot bag: Everything these two kids need for skiing. Carried by one mom. Unlike Kulkea’s other bags, the Tandem is a duffel bag, complete with a carrying handle and shoulder strap. Usually duffel bags are a deal breaker for me, as I prefer backpacks, the better to keep my hands free for carrying skis, holding little hands or waving at friends. So why do I like this bag? Because it’s perfectly designed with ski parents in mind. The Tandem doesn’t just carry one set of gear, it carries two sets of children’s boots, helmets, goggles, gloves, extra clothes and so on. Compartments are smartly designed to keep your kid’s stuff separate and everything fits in a specific spot. Whether you’re ultra-tidy or need a push to get organized, this is a fantastic bag for ski moms and dads, and their little rippers. A friend packing the Tandem bag for his sister and himself. Here’s a one-minute video that outlines the Tandem’s features. The heavy-duty, waterproof fabric, the tarpaulin bottom and reinforced stitching. This is a bag that can take a beating. The ventilation grommets. While this might seem like a small detail, it’s important to let moisture out when the bag is zipped, especially if you’re driving home on a wet, snowy day. The two small handles on the sides. These make it easy to lift the Tandem ski boot bag into the car or store it on a shelf. The “cooler” design. The Tandem opens just like a padded beverage cooler, with easy access to the top pockets and 100% access to the body of the bag. The Navy blue fabric and the Kulkea logo trim. It’s a good-looking bag. This little handle, and an identical one on the other side, make it easy to load the bag into a car. First, the bag is designed for little kids gear (up to about ages 7 or 8). The maximum recommended ski boot size is mondo 22.5 (US Men’s 4.5 or Women’s 5.5). While you might be able to squeeze slightly larger boots and helmets into it, a better option is the Kulkea Speed Star backpack ski boot bag which your child can carry all by themselves. The Kulkea Speed Star kid’s ski boot backpack. It comes in boy colors, too. This doesn’t mean you’d have to trash the Tandem when your kids outgrow it. It doesn’t look like a kids bag, nor overtly like a ski boot bag. I can think of plenty of other ways to use it, including as a duffel bag for other outdoor and travel adventures. Second, the bag is big and could be heavy depending upon how you pack it. The Tandem dimensions are 32” L x 13” H x 12” W. These generous dimensions give the bag a whopping 62 L or 3200 cubic inches of volume. This means you can fill it up and fill it up some more. Conceivably, it could get heavy. I found it to be well-balanced for carrying by the handle or shoulder strap, but if you have a long way to schlep, a backpack type pack might be easier. On the plus side, the Tandem is an outstanding solution if you’re flying on a ski vacation. It can carry almost all of your children’s gear and I wouldn’t hesitate to check it at the airport. This is Kulkea’s other new bag for this season. Similar in design and function to their popular Speed Pack, the Talvi is both their most lightweight bag (weighing in at just 1.2 pounds) and most economical (MSRP $59.95). Kulkea’s Talvi Ski Boot Backpack. A simple top-loading bag with a roomy central compartment for a helmet, gloves or mittens, extra layers, lunch and so one, the Talvi also has easy-to-access front-loading boot pockets (one on each side). While the body of the bag is not padded, the back is and so are the shoulder straps. Here’s the Kulkea video showing all of the bag’s features. I think the Talvi is a solid option for day trippers. Because the bag is not padded (which makes it so comfortably lightweight), I wouldn’t check it for air travel. But for day trippers, it’s a solid option at a lower price. I’ve been reviewing Kulkea bags for several years now. The company started with the Boot Trekker and then added the Powder Trekker, both of which are designed with full compartmentalization (they call it the Intuitive Packing System). If you’re tidy, these bags are outstanding. The Kulkea Boot Trekker Ski Boot Backpack. I’m also a big fan of the Kantaja Ski Bag, a fully padded, fully opening ski bag with room for poles and quite a bit of clothing. It holds so much, you just have to be careful not to exceed the airlines’ weight limits. The Kantaja Ski Bag from Kulkea. Pack It Up! An Interactive Ski Packing List, Plus Two New Boot Bags from Kulkea, October 15, 2014. Wax and Clean: How to Care For Your Skis and Ski Clothes, June 6, 2016. The 2015 BSM Holiday Gift Guide for Skiers and Snowboarders, November 18, 2015. Ski Mom “Secrets” for New Ski Moms and Dads, November 4, 2015. Tips for Your Best Family Ski Vacation, Ever! December 3, 2014. Ski Boot Bags to Keep You And Your Kids Organized, November 6, 2013. © 2016 – 2019, braveskimom. All rights reserved. Any use or publication of content, including photos, requires express permission. Excellent! You’ve got two entries! Thanks for jumping in! Thanks so much for this post. This is a much better option for kids who are too little to carry their own backpacks – or who set those down and forget about them! Although certainly heavy to carry, it’s better to have these items all in one place for really little ones. Thanks Sarah! I have to say that while it could be heavy, when a friend packed it up with her children’s gear, it wasn’t heavy at all. You just have to resist the temptation to overstuff it with mom and dad’s gear too! Love your blog and all of your helpful hints to make our ski season more enjoyable! This boot bag looks awesome! Keep on writing!!! Thanks Dave! You made my day! Hope you have a terrific winter! Enjoyed reading the review. A good option for staying organized with 2 kids and not forgetting anything! Following on Twitter. Thanks! Thanks Ski Dad! You’ve got two entries and I appreciate you being part of our community! Just over 40% of my readers are men…ski dads and moms…UNITE! Always looking for a better way of carrying all of the ski equipment! We’ve resorted to using two bags for my daughter’s race equipment. This would maybe work for everything! Following on FB. Thanks Kris! There you go…one busy daughter who needs a bag for two! I love it. You’ve got two entries! What a great concept with some many ways it can be useful! As a single mom of 2 ski kids this is perfect!!! Thanks for letting us know all about it. Very cool bag. The photos and vid really help me see what it can do. I also followed on Twitter. Thanks Karen! Good luck and you are entered twice! With three little ski racers, good bags are key to a good ski day! This is a great option for getting to and from the slopes. Following on FB. Thanks! Thank you Amanda! Best of luck to your 3 little ski racers this winter! You’ve got two entries! Wow! With 3 ski kids under 9 (and the 4th maybe starting this season) their ski gear is always a mess in the car getting to the resort…and forget about what the car looks like after!! That tandem bag looks awesome!! I’m pretty sure I need it in my life! Thanks for all your great tips for skiing with our kids & introducing us to so many great products to make our experiences so much better (& easier)! Hi! I remember you: a past helmet winner! Your life sounds like fun and I’m so excited for your 4th to get after it with his/her big siblings! I think you do need this in your life! Thanks as always for your support! Yep!! That’s me! That was back when I was getting my 2nd on the mountain (he was 3)!! The helmet is still getting LOTS of use! Love following you guys!! Thanks Becky! Enjoy every moment! And you’ve got two entries! This would be fantastic! We so need this. Between regular gear and race gear… I don’t even need a 2nd kid. Have followed Kulkea… I’m eyeing their ski bags too.. I hadn’t thought of the ski racing angle, but it makes so much sense! You are the second race mom to suggest it! And yes, the ski bags are great. Thanks! That bag is awesome! Perfect for little kids and slightly frazzled moms carrying ski gear for them. I love the bag color as well. Thanks for posting the great review. Maybe less frazzled mom is you get this bag! Thank you so much! This is awesome, I’m always looking for ways to organize all the kids stuff. I follow Kulkea on FB already. Wonderful! Thanks Kelly! And thanks for commenting..I haven’t seen your name in a while! I hope you are well! Two entries for you! Thank you so much for following them! 2 entries for you! Also, look for another Kulkea bag giveaway as we get closer to the holidays! The bags are awesome ! Just checked out their Facebook page and I am excited to see all the cool gear this year . Thanks Courtney! Did you like the FB Page? Let me know! Good luck! Thank you Carolyn! It is completely family-friendly. The venture should now become a happy adventure! You’ve got two entries. Good luck! Thank you so much for the review, As a Mom of two under 7’s… this could be a sanity saver 🙂 Following on FB and Twitter! And we moms need to preserve our sanity! Thanks Alex for the follows. You’re entered twice. Well said, Shaunna! Good luck! Great looking bag for hauling tons of gear during the habitual weekly ski lesson. Following on the FB as well. You’ve got it right! Thanks for liking on FB — two entries for you. Have you tried the all season surface at Buck Hill yet? Officially opens this weekend. Main complaint so far from pre-testers is the constant battle with the official state bird, the mosquito. Not sure if I’m quite ready to and/or be seen skiing in jeans just yet. Wow! We really need this bag! I’ve been schelping my kids gear since they were 5 months olds- they are now 5 and 3 and going on their 6th and 4th seasons. We practically live at the mountain all winter, so this bag would be so helpful! Following them on Facebook now! 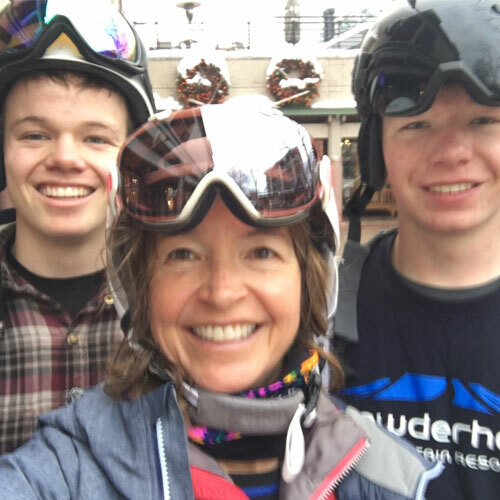 You are a super ski mom! That’s a ton of schlepping! Good luck! Two entries – thanks for the FB follow. Two entries for you Steve! Thanks! Wow, the TANDEM – Ski Boot Duffle looks super cool and unique! Thanks for the review! I followed the Facebook page to stay updated.